As part of a Poetry group on Twitter, I receive daily prompts - sometimes words, other times images, and, most recently a song prompt. With Image Prompts, it is simple - interpret the image in a poem any way you see fit. With Word Prompts, it's also simple - use the daily word in a poem. But this latest prompt, a song, is a different game altogether. Songs are, in a way, poems. Well, at least the good songs are poems. Songs tell stories, expose emotions, intents, psychological responses . . . But then there is also the music, which plays a vital role in how we interpret the meaning of the song. 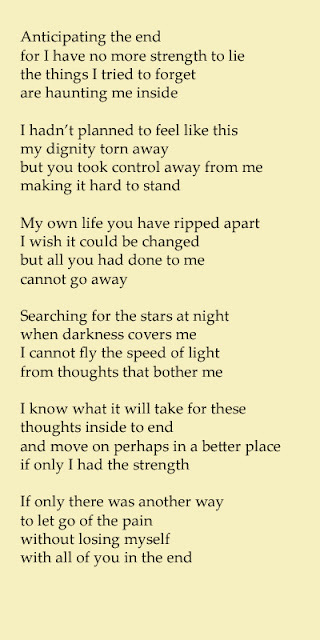 Holding on to what I haven't got"
Now being about the same age as Chester, having experienced some messed-up things myself, and knowing what I know, I decided to interpret these lines not as part of a song about an ending relationship, but as a song about inner suffering. The exercise is in no way meant to disrespect the memory of Chester Bennington. He was a very talented vocalist, and an amazing songwriter. I wish he was still around. 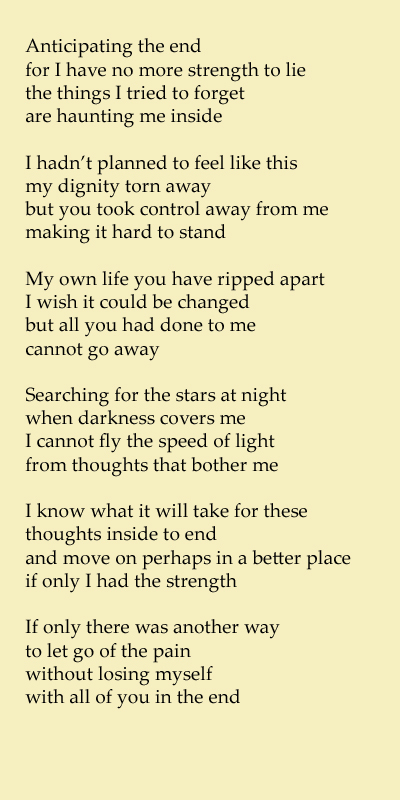 So, without further ado, here is my poem.